THANK YOU FOR MAKING SUCH AN AMAZING PRODUCT (Simply Natural Unscented Deodorant)AND HELPING THE WORLD GET HEATHIER! Hi Kristen, this is (name redacted for privacy). I was the gentleman that bought some lotion out in front of the Breakfast Cub when you were setting up on the street. I made it back to Michigan. Your lotion did me fabulous all the way through my whole trip. I would just like to say thank you very much and have a great day. Bye. Hi! I just wanted to tell you how wonderful the deodorant is. I have tried other 'organic' types and yours by far is the best. It keeps me dry all day long, even with our humidity lately. I think it's the combination of all the ingredients that makes it perfect! Anyway, I just wanted you to know. I love all your products!!" "Hello Kristen, I bought your unscented extreme cream on Sunday at the farmers market. I want you to know that Im really glad I did buy it because I think its great and it appears very safe. When I need more, I will definitely contact you." "Love your products and have been using them for almost 20 years!" rec'd my soap & the Sweet Almond oil today. Can't thank you enough. It smells sooooooo good !!!!!!" not kidding, your lotion is phenomenal!!! Just introduced it to my friend, hopefully, she'll Order, too. My daughter and I are hooked!! Hats off for bringing beauty and health to those women fortunate enough to meet you and your products!! Hadn't purchased your soaps that day at the farmers market, so looking forward to trying them. Talk soon with my next order!!! You need to make your extreme lotion in a 5 gal container!!! Haha!!! In this case, bigger IS better!" We bought your Lavender Deodorant for my daughter at the June OC [Oceanside]Farmers Market. Your deodorant is a LIFESAVER for her! It is the only clean deodorant she can use that actually works! And even better, she was left with discoloration from a rash she got when she tried using magnesium as a deodorant and the discoloration is now going away! We will definitely be trying your other products, too! I bought several of your soaps at Oceanside Thursday Market !!! I live in Washington on Whidbey Island. Love them, and will be ordering more soon !!! Thank you !!!" ...I love your products. You saved my skin! I use the tea tree (soap) for my face every day. I share the scented soaps with family & friends. Thanks again,"
"Hello Kristen, ...Thank you and we love your products! We will buy them as long as you make them!! Have a great day. Best"
"Dear Kristen, Thanks so much for sending your new product, deodorant with the light scent of lavender. I love it!! My friend Christine loves it too! I'm also enjoying using my lemon body oil (and no, not furniture oil.) Have a good rest of the summer and we'll see you in January. Your loyal customer,"
"Hey, I love your soaps, this is my second order and i'll be back next week for Christmas! :P"
"Thank you!! My sister lives in Encinitas, and I've been borrowing her extreme cream and now the original for 2 years. LOVE LOVE LOVE your products!!" "Thank you! I love your products, esp. the extreme hand cream. I am a nurse and it is the only hand cream that can repair my hands overnight after a day of repeated hand washings. Thank you! I will be placing my own order soon. Happy Holidays!" "I bought your product at the Pasadena Bead Show this past weekend. Already I can see and feel the difference in my hands. Thanks for such a great product!" "Wow! Picked up your Coconut Oil at the Leucadia Farmaer's Market. As an avid runner, cyclist and tennis player, my skin takes a beating. I rode in on my bike. Such a difference in my skin and hair in just a few days. Thanks so much for a great product!!!" family to bring back a bunch of cream." to come. Thank you so much!" "Hi Kristen! I love your soaps and have found that even in the dead of winter, my skin is not nearly as dry as some of my friends out here. I'm from San Diego, but I'm glad that you ship all the way out to Illinois so I can still get your soaps!" "Hello Kristen!! I lived in Encinitas from 1996 until 1998. That is when I met my girlfriend, Laura A. We have been the best of friends ever since! She can tell you that my heart is there, in San Diego . Well, when I called her on Sunday, she told me that she had just stopped at a farmers market in Encinitas to pick up 'the best lotion, ever!' Since I have the worst skin ever on my hands, I quickly asked her what it was, and she replied, 'Extreme Cream, from The Lotion Lady.' She told me how beautiful her hands are looking & feeling! I cannot wait for my lotion, from my beloved Encinitas, to come & save my hands!! Thank you, Kristen. Sincerely,"
"I found you at the Harvest Festival in Pomona ...this is the best lotion I have found for my hands which spend their days cooking, gardening and doing dishes." you again for your products." I love your lotions. The heavy duty (Extreme Cream) unscented made my hands feel like they did when I was 20. I put on the body lotion this morning and have a feeling I'm not going to run dry by afternoon. It was so nice to meet you and experience your wonderful product. I am so sorry for the absolutely abysmal weather." I bought one jar of the extreme cream from you at the Oceanside farmers market. My 18mo old son suffers from eczema badly. We have tried many many creams and lotions. I remembered my little jar from California and tried it on him. Literally overnight his skin was flawless and soft. I've used it everyday since on his sweet skin and it has made all the difference. Thank you so much. I ordering more extreme cream for my son and for a friend. Love it!!" "Extreme cream is saving my hands in this cold weather. It's the best!!" ...I have never looked farther than your lovely products. They are just right, local, perfect!...I gave my son the unscented lotion when his daughter Stella was born last year...I tried to impress on him the value of a nice lotion with no parabens or additives on his little girl. Shes turning out fine so far! Have a wonderful holiday, and thanks again." it, my skin is hydrated and I can feel good about my skin drinking it up. creme on my lips and it helps a little. Thank you! Sincerely,"
I can definitely understand why the gardenia is a best seller! I won't need the body lotion before Feb.3...........so I will place my order online. Thank you so very much for making the most amazing Gardenia Scented Body Oil and Body Lotion that I've ever found. I get so many compliments...........everyone wants to know what perfume I am wearing............and how do I have such soft skin!!!! Note: Gardenia scented Lotion? That's right! I take special requests all the time. Send me yours, today! "Thanks so much! I love your products and have seen a significant change for the good in my skin. I also love to give your products as gifts and always hear back how much family/friends enjoyed using them. I'll be watching for the last bar of soap in a few weeks. Sincerely,"
I just got back from a manicure and pedicure and my lady complimented on how much softer my hands, legs and feet were and I wanted to let you know since your lotion has made the difference. She asked me to give her the web site which I did. Terrific!!" "Aaaaaah...so good to have EC (Extreme Cream) back in my life--thanks a lot, Kristen!" "My friends in Australia loved the Cool little vacation bags!" About 8 years ago, I bought a jar of Extreme Creme for my dry elbows. I have not had dry elbows since and the jar is about 25% full, so I guess it is time to get another one. I will likely get some for my friends too since it is Christmas time and yours is a product I can really say I am happy with. As I get older (46), I have started getting dry skin on my face so I have begun using it more often. I'll get up to one of the Farmer's Markets and see you soon. Thanks." Definitely worth waiting for! The rose oil is magnificent! Thank you for the rose soap too. It is lovely." i must tell you how much we love your cream. We purchased it at the Farmers Market in Encinitis a few months ago, and wow!!!!!!!! !did it ever help my cuticles. We have the Amazon Herb Booth, we have not been back for some time we want to but life is so full just now for us. Are you still there on Sundays? Thanks and so looking forward to my creams arrival." I have received the creams and lotions. I love them. My friend said my hands are like baby's but I am over 40. I am going to have her try it too. Thank you for the wonderful products." "Thank You, I will certainly share the cream with friends. I love the stuff. I am writing to let you know that we received the soap and Extreme Cream within 2 days of my order. Thanks for such great service. My wife found you at the Dana Point Tall Ships Festival. Well she was using the Coastal Sage soap in her bath before bed - and frankly, came to bed smelling like she had been on a hike in the chapparal. It wasn't until our remodel, and I was forced to use the bath tub, when I tried that bar of soap sitting in her soap dish. It was before work, when I first tried it, and honestly, it totally destressed me from my pre workday tension! I just purchased 3 bars of your "Lotion Lady" handmade soaps at the Oceanside Farmer's Market only because the "Other Soap Lady" hadn't returned to OFM in some 3-4 months, which is when I'd last bought soap from her and which I really liked. That was then ... this is now! Thanks for explaining your process of making these incredible soaps or I may never have tried them. To my amazement I can say I'm truly enjoying every opportunity to lather up and experience the cleansing properties and lingering scents of your soaps. I'm about through my first bar (don't recall the name of it, but you said it was your #1 seller--let me know which one so I can reorder when ready); the other one the Plumeria, and the 3rd bar is the Lavender Oatmeal. I'm on a bit of a tight budget right now ... looking for a job, but I plan on bookmarking your webpage so I can order some of your other products when I'm able. Just wanted to say THANKS! for a really wonderful personal care product!" "My friend from Seattle, Washington sent me your product for my birthday about a year and a half ago. She sent me your soap and it has made a WORLD of difference for my skin. The three bars have lasted so long and I have converted my husband to the soap as well. Both of our skin is virtually acne free. Before we used to get occasional acne. Thank you so much Kristen 'Lotion Lady'!" I ordered the lavender dryer bags and lavender soaps this last weekend and received them today ... Thank you for your speedy delivery, I was very pleasantly surprised! I love the products I purchased. Anyway, thanks again for your great service." "I did not expect such rapid shipping this close to Christmas. Not only did I receive my order, it was better than described! Fast shipping, well packaged and it smells great. I will be back for more." "Hi,I just wanted to let you know that I received my order and thank you so very much for the great service and fast response time. I just love your products and I am sure the friends that I am sending your products to will feel the same............Merry Chrstmas and Happy New Years." Not sure if you remember me but I bought some Extreme Cream for at a Farmers Market a month or so ago for my 2-year-old daughter's Eczema but by the time I got home (we live in Austin) the shea butter had crystallized and it was kind of crunchy. You immediately sent me another jar and it has worked so well!! First thanks for getting it to us so fast. Such great customer service! But most of all thank you for making such a great product. It's the only thing that has worked and really makes a HUGE difference. Thank you again!!" I just wanted to let you know that the Lotion lady products have made several gifts. People just LOVE them. Where I live there are several farmers' markets. I wish you were near by....your items would sell and FAST. (I am in California - near San Francisco) So glad that the items can be obtained via the web. Also, I continue to buy them because of what it does for my skin. Mixing the lotion with an oil....it is great! Both of my boys LOVE the Sandalwood soap. Until my next order....have a wonderful weekend." "Hi, I just bought some of you lotion at the fair in Solana Beach and I have to tell you this is the best lotion I have ever had in my entire life, extreme lotion. I laughed at you when you said that this would last a year, which I still don't think it will, but (laughter), because I use it a lot. But, I mean this is really...really, really, really good lotion! So, thank you." Anonymous caller, Transcription of voicemail received. "I would like to say that I truly love your site. You are very detailed with each product you have." Just wanted to let you know I received my order today -- incredibly fast shipping. Everything looks wonderful (and smells fantastic!) and everything was very well packaged. I am a very happy customer! Thanks so much!" "Thank you for your excellent service. My order arrived yesterday. The soaps smell heavenly. Thank you again." ...I didn't know you had a choice of scents with the original lotion. I do know that your soap is wonderful. I am just loving it. My hands are back to being very soft and my finger tips are not chapped. Have you thought about doing face moisturizers? I bought the gift crate for my daughter-in-law. She also loves lavender. Your's really is the best smelling lavender." thanks for sending the new bottle of the original lotion. The smell is so intoxicating! I'm so happy with your products, I'm telling everyone. My friend loved the gift set. Thanks again." Received the soaps today. They smell great. Thank you for such quick service. I will definitely be ordering from you again. It's nice to have that personal touch.Thank you again. Thanks,"
I've been using your Extreme Cream for a few years. I service swimming pools and do installation and repair of pool equipment. I've been at it for thirty years. Hands in and out of chemically treated water, dirty pipes, PVC primer and glue. My hands get to where there would be cracks across the grain to the meat. Ouch!! Three consecutive nightly applications of Extreme Cream and my hands are silky smooth and soft. Miraculous! I've tried Bag Balm, countless skin therapy lotions and nothing comes close to your wonderfull product! In fact, nothing else worked. After buying one jar every year at Bernardo Winery I felt it was about time for a testimonial. Hopefully it will induce others to try your products. It is definitely a mutually beneficial situation. Thanks you,"
"I got the extreme cream at the street fair this summer, and now that it has finally run out, I've got to get more! (and more, and more) Thank you for making this product. My skin has never felt better! " I am a Massage Therapist, located here in Portland OR. I am looking for a few great "handmade" products to use and sell in my practice...I have heard of your lotion from a client that is a flight attendant and she just raves! "I just wanted to tell you how much I have enjoyed using the 'Extreme Cream'. I had purchased a hand cream at a spa back in April and I was disappointed in it because it seemed to only coat my hands and didn't really absorb into my skin. Your cream seems to penetrate more into the skin. I want to thank you for contest and the opportunity to try your product." I just had to write, although I have seen you about town, in your van and have stopped you to tell you in person how wonderful your products are. I wanted to say it again in writing. As much of a fan I am of the Extreme Cream, this is about the wonders of Calendula & Tea Tree Oil. With the recent heat and humidity I developed spots of rashes between folds of skin. I was about at the end of my rope with the itching and my scratching. I then remembered I picked up the Calendula & Tea Tree oil for my husband. I tried and felt immediate relief for the itching and with in a few days the rash was done. What a miracle! thank-you, Thank-You, THANK-YOU! BIG cyber hug for you. " I just want to say how wonderful the Extreme cream is for sunburns. After a sun drenched day at Disneyland, my forehead and neck were bright red. Normally, this would start to flake and peel after a day or two. However, after applying the cream before I went to bed and the next morning, my skin has felt great. No peeling. No flaking. No pain. You are making great products. Keep up the good work. " I just received my soap order yesterday, the soap is wonderful! I was paralyzed from the waist down 4 years ago and ever since then my skin has been very sensitive.. I've been looking for soap that is kind to my skin... and I think now I have thanks to you! Thanks also for the little goodies I may just have to order the original lotion soon." I left you a message tonight on your machine but neglected to tell you that I wanted to place an order. I think it sounded like I sold something already. Anyways.... a friend at work LOVES your Gardenia Extreme Cream, and uses all of MINE whenever I'm there!!! I'm almost out too, so could I please order 2 jars of Gardenia? ...Thanks alot." Note: Gardenia scented Extreme Cream? That's right! I take special requests all the time. Send me yours, today! I just wanted to thank you for holding a monthly contest. I'm very glad with the quality of your product. As soon as we start to run out of this first jar I know my boyfriend will have me ordering more! Thank you again. Note: "N.A." won December's contest and received her prize in January. She is describing original Extreme Cream, not to be confused with the "Absolutely Unscented Extreme Cream" which has no scent. Glad you like it, "N.A." Aloha! Tom is using the hand cream you sent. It is clearing up his hands!!! He has tried prescriptions and many many otc's to clear them up. The skin on his hands gets really hard and cracks open, even bleeds. Tom will sit in the evenings, watching TV and take a little bit and rub in his hands. IT'S THE BEST HE HAD FOUND!! So far he has only used the cream from the lid, not even using from the jar yet. A little goes a long ways! So thanks so very much. Have a great day and talk to you soon, I'm sure. 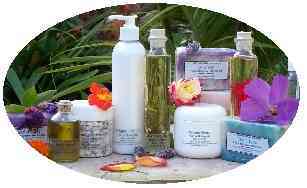 I purchased your products at the Rancho Bernardo Winery Craft Fair, on Mother's Day 2002 and absolutely love them. I am a massage therapist and initially purchased the Plumaria Body Oil for client use - but decided to keep it for myself, I loved it so much. I am also an Aqua Aerobics instructor and use the "Extreme Cream" to combat the chlorine effects on my skin. Your products are great...Thank you - Thank you - Thank you." "I really like the fact that your products are so gentle to the skin and environment as it is so hard to find both and yet find a selection as varied as yours. I especially like the soaps and the variety of fragrances, especially the Hawaiian ones. It is kind of like having the wonderful fragrances of paradise while being in your own home so far away. Gosh, I am so sorry as I am not very good at comments." "I received my lotion and it is hard to put into words just how much I love it. I received in on Monday and immediately tried it. The lotion itself is so silky and smooth and I love the way it has a light scent. I also love the way it does not leave any greasy feel to the skin. I brought it into work yesterday morning so I could use it at work. A few co-workers saw it and asked if they could try some. I said yes and they all had the same reaction as I did. I gave them your site url so they could purchase some for themselves. I hope that is okay. You have my business for a long, long time! Thank you so much"
My daughter and I met you at the Seaside Bazaar on Saturday. Wow! Your products are better than I'd hoped. The cream is incredible. I know my mom is going to love it, too. It was great to meet you and know you and your products are out there, just waiting for me. Sigh. I hope everything keeps going well for you and your family. Thanks for the good vibes and good products,"
"I love your stuff!!! Hope I win this month . Thanks for your work, its a true find." I recently met you at the Spring Arts & Crafts Fair at the Bernardo Winery. I purchased your Amazing Grains and Sea Salt Scrub and I am delighted with your products! I have used them only twice and I already see a difference in my skin. I will be ordering more products from you in the near future as well as telling everyone I know about them..."
Just tried sample of extreme cream you sent with my last order. Both my husband and I loved it!! So had to order the full size. Great for chapped dry wind burned hands!! Love the handmade soaps. China Rain Is my favorite Thanks for the free sample!!! You will hear from us again soon. You have good products and they are delivered in a timely fashion as well!!" ...I had to write you and thank you for putting me on to the Calendula, Comfrey & Tea Tree Oil. You witnessed the mean looking injury I had on my hand; I wish you could see my hand now. It would be a real testament to your products. It worked better than any antibiotic ointment I have used in the past. Also, for the extended regular treatment I was amazed how very little oil was used. ...I will never be without it. Best Wishes, God Bless.... and keep up the good work!" Best to you, and I'm sure we'll be ordering more soon." ...I met you during the UCSD Fall Qtr Library Walk Vendor Fair and bought a jar of your extreme cream. I also saw you again later at a street fair in Encinitas just before Christmas. I re-introduced myself and I had my golden retriever with me. Anyway, what I want is to buy 4 -5 more jars of the extreme cream and try the body lotion..."
Thank you for the Gardenia Body oil. My girlfriend loved it. Your quick service was really appreciated. I am sure we will be doing business with you again in the future. Thanks again,"
I purchased your Extreme Creme and the oatmeal vanilla soap and I LOVE both! I just wanted to tell you that the cream especially is amazing. I had the worst dry skin and your creme really works. I actually am going to place another order today to try some more of your stuff. Thanks again!" ... The lotion is perfect for me. Knowing that a particular lotion doesn't work for everyone, I feel very fortunate to have found yours. This morning I gave away six bottles of lotion and now have space for the four that are upcoming. My dermatologist will be very pleased to see the healing that has taken place. I will be sure to tell her the name of the product and the source..."
I am so lucky to have discovered your lotions. My chronic eczema condition is no longer chronic! My skin drinks up the lotion! Living in the desert has been so hard on my skin, but I have found my cure. I believe you're a God-send to me. Thank you." I have been using your Extreme Cream, at night, for a year, and love it. A rancher from CO. asked me for my extra jar, I hope she continues using it....so I am ordering some more.. This past winter was the first winter that my hands haven't suffered with 'cracks.'..." I discovered your products at a vendor fair at UCSD, but have since moved to New Mexico. I am so glad I can order your products on line. The extreme cream works great in the extreme dry of New Mexico! It is great for chapped lips too! ..."
p.s. can't wait to get my Patchouli!!!! " I have been a regular customer for several years but now have moved to Central Oregon. I am glad that you have made it easy for me to continue using your excellennt products. Thanks! " I'm a software quality analyst and I must tell you your Web site is excellent! It was so so easy to find the product I wanted and to place my order. Kudos to whoever designed the site. I do a lot of online shopping and this is one of the best." i am so in-love with your line of skincare products. they are magical. this i do for me. thank you for helping me to create a special moment in my day when i just take care of me. with five children you have no idea just how important that is. thank you,"
My friend Cheryl C. swears by your products so I thought I would give them a try. She says nothing works better than your stuff! Looking forward to the lotion. My hands take a beating every day since I am in water constantly. I work at a school cafeteria. " This is great...I met you at a craft fair in O.B. and purchased some of the Extreme Creme (which I love). However my mother stole it from me (I guess she loves it also), when I was visiting last weekend in TN...I hope you continue to make such great products, my extra sensitive skin thanks you!"